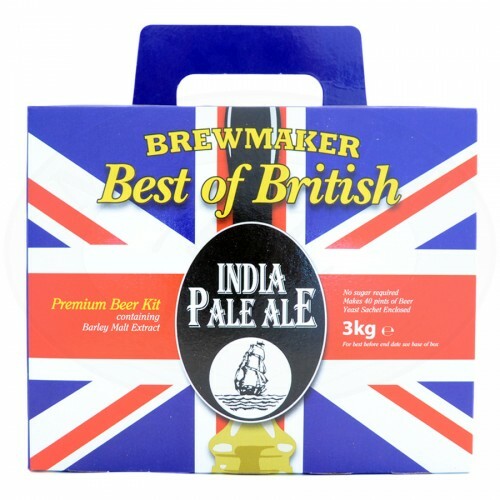 “India Pale Ale” beer kit for the production of 23 litres dark-copper-coloured, medium-bodied beer. Delicate beer with a moderate priming, it gives a general dry sensation when compared to the sweetness of malt. Originally brewed to stand the long journeys from England to India, it had to have a higher alcoholic and bitter level in order to be conserved until the last days of the navy cross. it is more full-bodied and less alcoholic then the “Brewmaker Premium India Pale”. The package contains a dry yeast sachet. To be served at 12°C.